Referring to my last post before the New Year (Dec. 12, 2011), the coupon collection essay is nearing its final editing stages. One main aspect of this essay that had to be defined in the very beginning of the introduction was the definition of a collection. I used the examples of private and museum institution collections to examine how these two types are managed, archived, and exhibited. Referring to Susan M. Pearce’s, Archaeological Curatorship, who references her curating and archiving methods that are used to maintain a museum institutions collection; Pearce states her book is not a manual for this type of curatorship, but is intended for future development of theory and practice. I have employed Pearce’s methods beyond the museum collection concept. 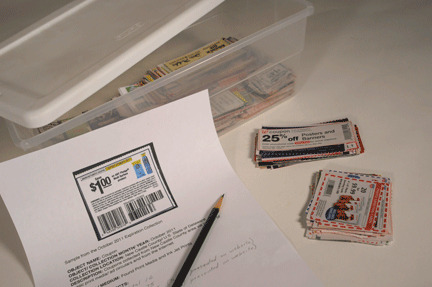 This has enabled me to archive and develop a management system for my coupon collection. My coupon collection is a smaller scale version of a collection, but with my recent experience of archiving the coupons the only difference in the process is that there is not an “official” curator or a museum institution collection policy. The argument I bring forth in my essay in the section Forming A Collection is that these institutional terms tend to imply a form of persuasion to define a collection, but can they imply new theories and practices for objects as artifacts of contemporary society? As an artist, rather than using fine art methods of defining the coupon collection with the concept of print images and visual representation, I have acknowledged and employed the present day material culture methods. This has enabled me to demonstrate the significance of the coupon collection by analyzing the print objects as artifacts and cultural forms of the present day social interactions between mass consumption and the print media culture. I want to refer back to the concept of private and institutional collections. The activity of curatorship and institutional management policy for the collection tends to lead to an exhibit for public viewing. I am using these curating concepts with a collection that is being obtained through contemporary means of the print media culture that already has a public presence. The collecting process has been documented on hard copy form (object information card) as well as cyberspace. The images with this post are documentation of the management of the collection. 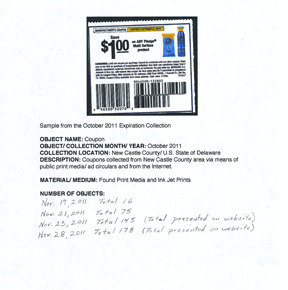 The images are the October 2011 Expiration information card and the storage system for the grouping. The cyberspace presence contributes to my activity of archiving and management with the coupon collection that usually is not present with a physical exhibition. In the Dec. 12th post I also referenced my exploration of future presentation/ exhibit options. Considering another future option and concept for a public viewing is “Revisiting A Collection.” The methodologies were introduced to me at a workshop that I took at the Social History Curators Group conference last summer. The main idea of revisiting a collection is for a museum to open up a section of their collection to community groups and capture participant’s knowledge of the collection. This also has to have some form of guidelines of considering the types of artifacts and the participants understanding they are contributing to the collections heritage with contemporary knowledge. Even though my collection is young, it would be an intriguing project. I will consider future proposals outside of my community that I have collected the coupons from. Such as other U.S. states, countries, institutions or community groups. This would contribute another perspective beyond my private collection research as well as another public accessible concept to contribute to the coupon collections status. 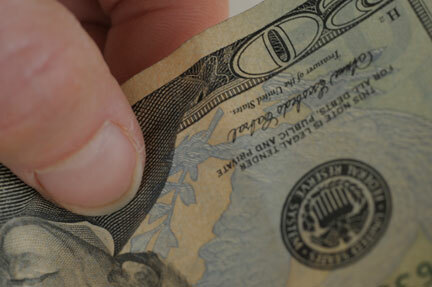 Paper money that was being analyzed for its print qualities is a recent observation I had at a local luncheonette. A twenty-dollar bill hanging on the bulletin board over the cash register was brought up in conversation. The bill was unpinned by the owner of the luncheonette and brought over to the row of customers at the counter. The questions began with what feature was missing from the money to make it less than authentic. This particular twenty-dollar bill was a counterfeit and hung up as an example. The owner asked a customer to volunteer one of his twenty-dollar bills to use as a comparison. A customer's bill emerged and the intriguing part of my observation and participation started. The owner started to demonstrate with his thumbnail the ridges through out Andrew Jackson's coat. The counterfeit was lacking this fine detail. Soon the row of five customers was passing each bill and closing inspecting it with the sense of touch. I noticed a couple of the customers repeating the delicate act over till they had felt the embossment. This observation took the aspect of money out of its standard economic form and was inspected for its print qualities. Even though it still referenced faux and authentic versions of currency, it was an experience to critique two forms of a print in a luncheonette.